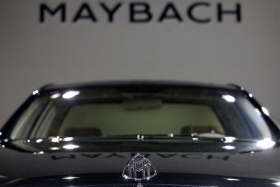 FRANKFURT — Daimler AG has delayed a decision on the future of Maybach by about a month and now is considering turning the luxury nameplate into a subbrand of Mercedes-Benz. According to three company sources, Daimler is still considering a partnership with Aston Martin in which the British carmaker would produce the second-generation Maybach. Aston Martin has created four concepts for Daimler based on the next-generation S-class architecture. A third option is to kill the Maybach brand, the sources said. Daimler CEO Dieter Zetsche confirmed this month that Daimler has been in discussions with Aston Martin. No other potential partner has emerged. Daimler originally said it would decide the fate of Maybach by July 1. That decision has been delayed until late July, when the Daimler supervisory board is next scheduled to meet. Folding Maybach into Mercedes is now under consideration. Under that scenario, Maybach would be a subbrand, like AMG, and the Maybach name would be used for Mercedes’ top-of-the-line versions of its S-, GL- and CL-class vehicles with only minor design changes. Spokeswomen for Daimler and Aston Martin declined to comment on the future of Maybach.